There is a dramatic change coming to WordPress. In 2018, the world’s most popular Content Management System will have a new editing framework that completely refreshes the user experience. 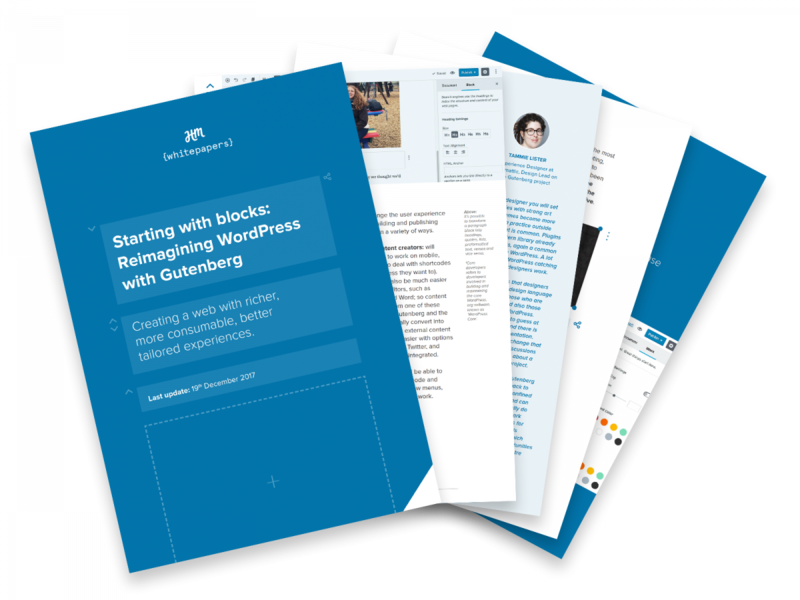 Gutenberg, as it’s named, will transform the model for editing and managing content layouts, and introduce a new structure for content components. A white paper written by Human Made. All content licensed under Creative Commons BY-SA 4.0. The block-based architecture of Gutenberg facilitates and simplifies the development of more intuitive enterprise level content creation tools. The block architecture also adds a degree of flexibility at the enterprise level by opening up the WordPress ecosystem to easier integration of objects from the outside world. This white paper covers key challenges in implementation and adoption, as well as advice on how enterprises can act now to prepare themselves for a future with Gutenberg. As Project Gutenberg evolves, we’ll update this white paper to keep the information fresh. This latest version was updated 20th December 2017.